BlackBerry Tour coming to Verizon in July? | BlackBerry Blast! BlackBerry Blast! > News > BlackBerry Tour coming to Verizon in July? BlackBerry Tour coming to Verizon in July? We've got pretty solid confirmation that the BlackBerry Niagara will be the BlackBerry Tour, but no solid release date has been confirmed yet. BGR is reporting that their Verizon "ninja" has informed them that July is the month for the BB Tour release. 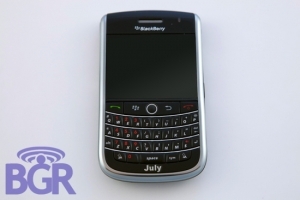 RIM has a habit of delaying their device's launch dates, but BGR says late July should be the actual release date. Stay tuned.